Beautiful, suspenseful, and emotionally gripping. Why did I wait so long to read it? Idk, but I regret waiting. As you can tell from the synopsis, this book is about a young girl named Melanie and her gifts (no pun intended). But to tell you what these gifts are would completely spoil the book and that is not why I am here. I’m just here to tell you that you need to believe the hype and grab a copy. Better yet, get the audiobook, narrated by Finty Williams. I feel she completely and flawlessly captured the essence and vulnerability of each character and you truly will grow attached to each and every one of them. As far as the writing goes, Carey delivers a crisp, genre-bending novel that contains deep characterization, beautiful yet grim environments, and well-paced scenes that will have you on the edge of your seat. It isn’t your typical Z novel: blood, guts, and brains covering the streets. It is smarter than that, pushing the envelope with new ideas on the post-apocalyptic landscape and the need for survival. If I had to compare it to anything, I would say the movie “The Happening”, but just the idea of the movie. Not the movie itself because it was freaking horrible. You know what, I can’t believe I just made that comparison. I’m sorry, Carey. 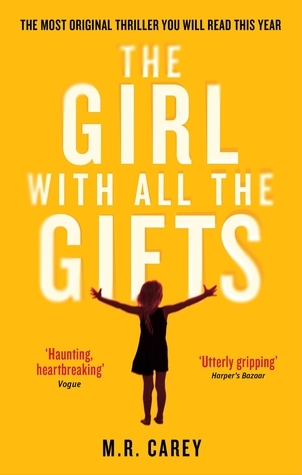 Speaking of movies, The Girl with All the Gifts was also made into a full-length film and is currently available to buy/rent. I haven’t personally seen it, but I have heard good things and it did get an 84% on Rotten Tomatoes. It does include some big names like Glenn Close, Paddy Considine, and Dominique Tipper (The Expanse), so there’s that. Rear review. Really liked the movie, I should read the book. I loved this book, but I haven’t seen the movie yet either! I am actually surprised to hear it has such a high rating at RT, because despite the popularity of the book I heard relatively little about the adaptation. Maybe I should take a look. Absolutely! I believe it is still free on Amazon Prime. One of my favorite books. Just so gorgeously written. Gah! I wasn’t much of a fan of the movie adaptation, however. So much of the heart of the story was missing. That’s disappointing, but I do agree that the book has a ton of heart!